A young North Staffordshire businesswoman is ensuring a well-groomed future for the nation’s pampered pooches. 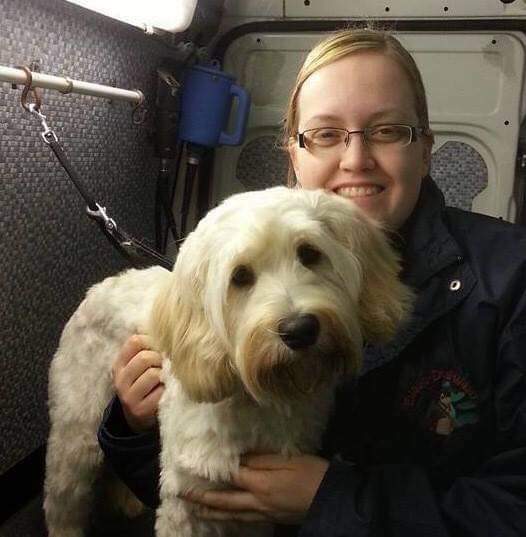 Tasha Caddy, 26, has been appointed as training manager for Dial A Dog Wash in the UK and Ireland and trains her apprentices while she grooms dogs for the company’s Newcastle-under-Lyme franchise. “We find the trainees hotel accommodation locally and I take them with me as I do my work,” said Tasha. “There is a lot to learn if you are to become a successful professional dog groomer. Washing certain breeds and ensuring that all the dead hair is gone can take several hours and we also groom dogs and clip nails. Dial A Dog Wash offers grooming services including washing, conditioning and clipping, all carried out on the customer’s doorstep in a specially-adapted van. Tasha’s dad, Dave Caddy was among the first British franchisees when he set up Dial A Dog Wash Newcastle-under-Lyme in 2006. Dave handed over day to day control of the local franchise to his wife, Diane and daughter Tasha in 2016 and now splits his time between North Staffordshire and Ireland where he is the Dial A Dog Wash master franchisee. Tasha also manages the family’s successful cleaning business, Spot On cleaning where she manages around 40 part time cleaners. The Caddy family’s Dial A Dog Wash empire takes in franchisees in both North and Southern Ireland and he has also established franchisees in the Channel Islands, Isle of Wight and Isle of Man. For media enquiries contact Nigel Howle – nigel.howle@howlecom.co.uk, telephone 0776 2043436.